I finally spent the birthday money I’ve been hoarding for the last month. You know you’re getting old when you spend your birthday money on bedding. 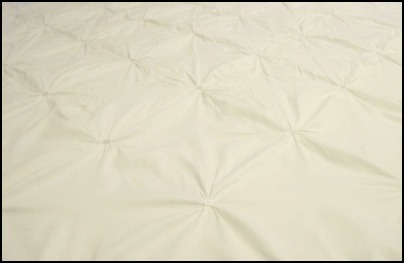 But it was the only way I could justify dropping $100 on a comforter. That and the fact that the West Elm one I originally wanted was way more expensive. So, I went searching online and found a similar version at Target. 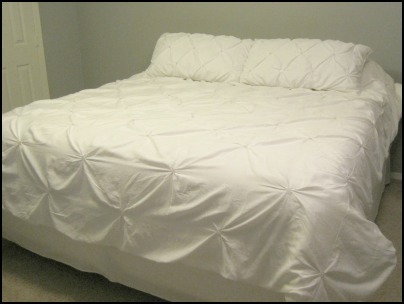 It was cheaper than the West Elm version and it included the shams and bed skirt. And it was a comforter, so no insert necessary. Ding Ding Ding, I think we have a winner! Of course it came out of the bag wrinkly and smelling a little funky, so I had to wash and iron it. Let me tell ya, ironing this bad boy sucked! But I think it looks a lot better. Before you see this…yes, I know I need a headboard. I’m so happy with my decision. It makes me smile every time I walk by. I was a little annoyed that there were some dirty spots on it when I pulled it out of the bag (let’s be a little more careful in the factory please), but they aren’t really noticeable once it’s on the bed. And I can always bleach it. So what does my boyfriend think? Oh please...it's your birthday present to yourself! Don't even consider sewing it yourself. Well, you're obviously past that thinking since you already got it so yay! Congrats..it looks very pretty and comfy! 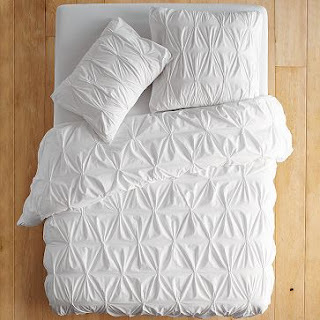 Oh, I so want white bedding. It's my fave. But it's my clean freak husband who thinks it will be too hard to keep clean. Sigh. That is BEAUTIFUL! I want to copy you...would you be offended? Did it come in other colors? Love it--we have the same set! I'd been eyeing it for months at Target and it finally went on sale a few months ago so I snagged it up. Nice choice!